"Indian Capital of the Nation"
Anadarko got its name when its post office was established in 1873. The designation came from the Nadarko Native Americans, a branch of the Caddo, and the "A" was added by clerical error. In 1871, the Wichita Agency was reestablished on the north bank of the Washita River after being destroyed in the American Civil War. The Wichita Agency administered the affairs of the Wichita, Caddo and other tribes. 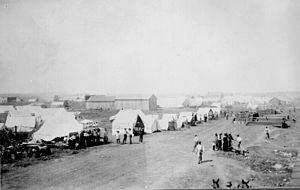 In 1878, the Kiowa-Comanche Agency at Fort Sill was consolidated with the Wichita Agency. In 1901, the federal government allotted the lands of the Kiowa, Comanche and Arapaho Reservations, and opened the surplus land to white settlement. On August 6, 1901, an auction was held for homesteads and town lots. Around 5,000 people were living in "Rag Town" on the east edge of Anadarko awaiting the auction. Although 20,000 people were present for auction day, Anadarko's population dwindled to 2,190 in 1907. Anadarko, self-titled "Indian Capital of the Nation", is home to the annual American Indian Exposition. It is one of two places in Oklahoma where a Lenape tribe is headquartered, the other being Bartlesville. The city houses the National Hall of Fame for Famous American Indians. Anadarko is named after the Nadaco, a Caddo band now affiliated with the Caddo Nation. In the Caddo language, Nadá-kuh means "bumblebee place". The Caddo are a federally recognized Native American tribe for which Caddo County is named; Caddo County is part of the former reservation of the Caddo, Wichita, and Western Delaware, prior to allotment in the post-Dawes Allotment Era. The Redskin Theater in Anadarko, Oklahoma. The town's population is 41% Native American. Culturally, Anadarko is rare among Oklahoma cities as Native Americans form a near-majority. Locals are often familiar with a few basic Indian words, such as haw-nay, Kiowa for "no." Wichita and Apache words are sometimes employed in casual conversation as well, such as hangy, ah-ho, ebote, and bocote. Native American motifs are commonly used for design, art, and other aspects of daily life. Anadarko has a Bureau of Indian Affairs office. The town is situated between the Wichita, Caddo, and Delaware reservations to the north, and the Kiowa, Comanche, and Apache reservations to the south. These reservations, along with all but the Osage Reservation in northeastern Oklahoma, were dismantled by the allotment of tribal lands to individual members, and the opening of the "excess" lands to settlement, in a series of land openings. The area surrounded by Anadarko was opened to settlement by a 1901 land lottery affecting the Kiowa, Comanche, Wichita and Caddo lands. Anadarko is home to Riverside Indian School, a Bureau of Indian Education boarding and day school for Native American students. Indian City USA cultural center, now owned by the Kiowa Tribe, is located 2–1/2 miles southeast of Anadarko. Indian City is now closed; it is yet to decide when it will re-open. ^ a b c d "2010 City Population and Housing Occupancy Status". U.S. Census Bureau. Archived from the original on July 21, 2011. Retrieved October 18, 2013. ^ a b c d Carolyn Riffel and Betty Bell, "Anadarko." Encyclopedia of Oklahoma History and Culture. Accessed April 17, 2015. ^ "Historical Averages for Anadarko, OK". Retrieved 2018-07-10. ^ "Anadarko Public Schools". Anadarko Public Schools. Archived from the original on 2011-10-13. Retrieved 2012-03-06. Wikimedia Commons has media related to Anadarko, Oklahoma. "Daily Democrat" newspaper hosted by the Gateway to Oklahoma History.